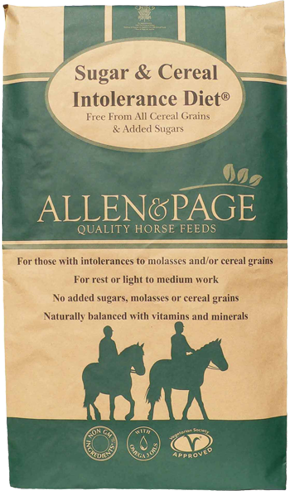 Sugar and Cereal Intolerance Diet includes good levels of fibre from unmolassed alfalfa and oat straw chaff and a small amount of micronised peas, linseed, several herbs and yeast to provide a rich natural source of vitamins. The inclusion of pre and probiotics is included to promote healthy digestive and immune systems. 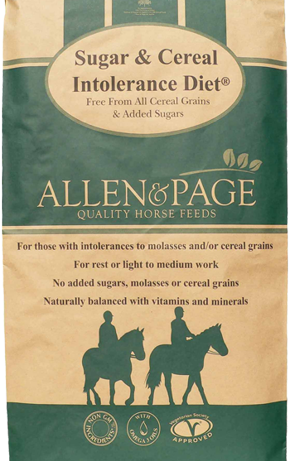 Specially formulated to assist with the management of horses and ponies prone to intolerance to sugars (molasses etc. ), or cereals (barley, wheat, maize etc.). This product is completely free from cereal grains. IMPORTANT, PLEASE READ: To get the best results from Sugar & Cereal Intolerance Diet, please make sure that you do not feed any other products that contain barley, molasses or any other ingredients that are high in starch and sugar.